Global marketing spend by online retailer Amazon has jumped 62% year on year to $241bn (£153m) partly boosted by a series of campaigns to promote its electronic reading device the Kindle. The retailer experienced a dive in its share price despite announcing a 39% rise in Q3 revenue to $7.56bn (£4.8bn). 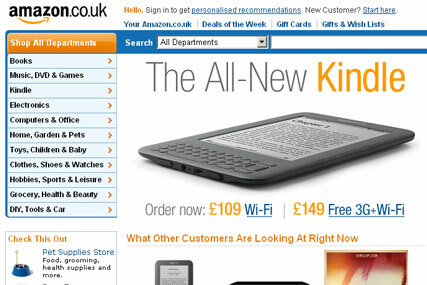 The company warned that its future operating profit could be affected by investment in new warehousing and marketing support for new launches, including the Kindle. Amazon said operating income could fall as much as 24% to $360m dollars (£228m), which caused a usually hardy share price to drop 3% in trading in New York overnight with shares stabilising at $158.60 (£1.01), despite seeing consistent rises over the last year. Revenue from the company's chief sales category, electronics and other general merchandise, spiked 68% to $3.92bn (£2.5bn) and revenue from books, CDs, DVDs and other media rose 14% to $3.3bn (£2.1bn). The best selling book during the period was 'The Girl Who Kicked the Hornets' Nest' part of the Millennium trilogy by the late Stieg Larsson, according to Amazon. Jeff Bezos, founder and chief executive of the Seattle-based company, said: "Every year for the past 15 years we've worked to improve the things customers care about, and this year is no exception. "This holiday season we'll have the best prices, the biggest selection, the highest in-stock, and the fastest delivery in our history." Amazon has recently started selling a new Kindle that offers an electronic-ink screen with 50% better contrast, a 21% smaller body and a 15% lighter weight. The company has also just made exclusively available the Heidi Klum range for sportswear firm New Balance.